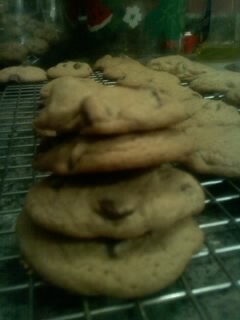 There is just something satisfying about a homemade chocolate chip cookie. The entire process is comforting and warming (and not just because the oven is turned on). My family could (and would if I let them) just eat the dough without ever having it baked. Chewy pieces of cookie with a chocolate chip in every bite. Then I stumbled across Ross Sveback who has become my chocolate chip cookie guru. First I find his recipe for chocolate chip cookies using rendered bacon fat as the shortening. 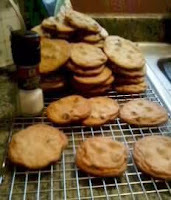 Then I find he has a Salted Chocolate Chip cookie recipe....and if that isn't good enough I finally learn (thanks to Mr. Sveback) that the trick to a chewy cookie is to let the batter sit overnight before baking! 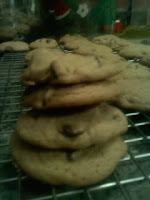 Now I have beautiful chewy-sea-salted-dark-chocolate-chip cookies in my kitchen just asking for a cold glass of milk. I am blown away that you love the recipe - thank you so much! I like the chewy, caramely way they turn out after letting them rest. bacon fat in cookies, now that is something I've never before considered. Good to know about dough overnight. visiting from 20sb. Thanks for visiting Laura. Growing up I was always grossed out by the recipe but years later and having become a foodie I've realized the benefit of bacon fat. Haha.